Do You Know Your Measurements? | Petite Plus, Meow! I’ve recently been shopping with a couple of slender, vintage loving ladies in my life – both of whom have mad sewing abilities, who come armed with tape measure whenever they are hunting for fabulous vintage finds. Both of these lovelies are avid online clothing shoppers as well. The key thing I noticed with both of them is that they knew exactly what their measurements were. Plus, they had a keen eye for what materials and fabrics … knowing what could be taken in/let out easily for possible adjustments to make these new-to-them-pieces work perfectly for their bods (mad skills I tell you). So let me ask you……Do you know your measurements? The majority of women don’t. I certainly didn’t. Perhaps I was too scared to know what they are. Aside from us all getting over the bad habit of comparing ourselves to other women, society has taught us that only thin can be beautiful. With most ads showcasing perfectly airbrushed tall and skinny women to promote impossible standards of beauty, it’s no wonder we struggle with self-acceptance. Sigh… But we – people – come in a variety of shapes and sizes. You can be the healthiest version of yourself and never come close to a size 4. And there is absolutely nothing wrong with that. The#MeasureMeBeautiful campaign encourages women to know their bodies and their measurements, because KNOWLEDGE IS POWER! And your measurements are just that – facts, information. In order to be an informed shopper – you have to know your size. Become educated and empowered. Show the world that your measurements are just that: numbers, facts, statistics. And that they do not measure your worth, greatness, or beauty. Knowing your measurements will help you look at size charts and know what size you should be trying on in that store, rather than taking what you think is your “usual size” into the dressing room, having it not fit, getting discouraged, depressed and then telling yourself that you must lose weight immediately. That’s just ridiculous. Fashion should empower women with confidence rather than riddle them with guilt and sadness in retailer’s change rooms. Every woman has the ability to be a fashionista, regardless of their size (or income level, for that matter). Sizes vary from store to store, and every brand uses a different “fit” model for their line. So let’s throw away sizes all together and simply know yourself! When you know your measurements, you are in control – not the clothing or their designer. Here’s mine (and with this knowledge I’ve been in online shopping frenzy mode folks! It’s nuts!!! Stay tuned for blogposts on my haul soon) 😉 …. The #MeasureMeBeautiful campaign also seeks to reinforce that YOUR SIZE DOES NOT DEFINE WHO YOU ARE as a person! These measurements, my size, the number on the scale do not determine my worth as a person. And I will not let them determine my happiness. I am many things besides a Size 14, 16, or 18 (at any given store). I am also striving to be a body positivity activist. I am a writer & blogger. I’m a fashionista. I’m a friend, a sister, a daughter. A Learning Designer. An off-key karaoke singer. A lindy-hopper. A homeowner. A grieving mother to a recently departed fur baby (R.I.P. Berto). Why should we continue letting the fashion industry tell us we all must fit into their ‘sample size’ in order to be beautiful or fashionable? Mallorie Carrington of SmartGlamour came up with this fantastic campaign. She’s challenged me. Now I’m challenging you PPMeow readers, to get involved! 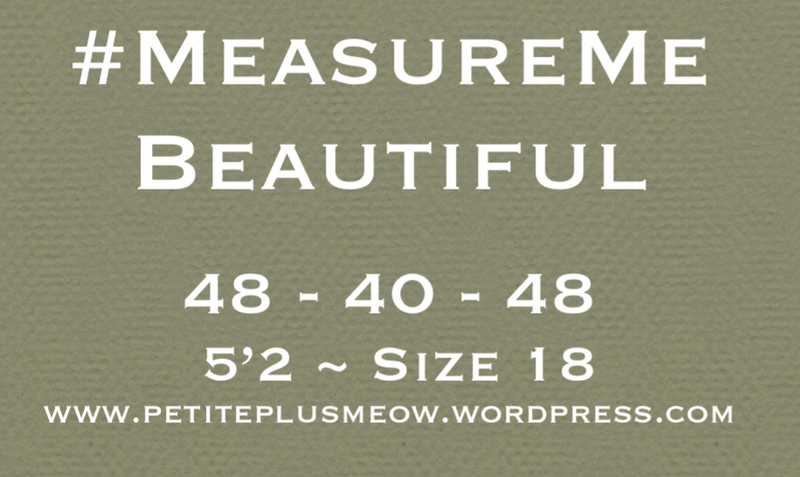 Visit the #MeasureMeBeautiful website to see what the movement is all about. Take a photo of you measuring yourself and share it along with your measurements on Instagram, Facebook and Twitter with the hashtag #MeasureMeBeautiful. Let’s show the world that beauty comes in all shapes and sizes. Aw, I love that you called me ‘slender’! Also, I am so glad you measured: now you know how AWESOME your figure really is. You are that elusive ideal hourglass. Which is why you look so gorgeous in everything– your curves are proportional. You are slender & lovely, Delovelyish! I want to thank you for this post Irene. I am just starting to embrace my body lately and realize I can dress beautifully and the way I want instead of just in baggy over sized sweats. I plan on using this post and the measure me beautiful campaign in my fashion class that I will be teaching in the fall. Once I knew my measurements (was not as scary as I thought) the a whole new world of vintage shopping opened up for me. Best thing ever to do. Happy Shopping Irene! Pingback: Corsets: Let’s Get The Skinny | Petite Plus, Meow! Pingback: CNL Designs: Redesign of Rosegal Dress | Petite Plus, Meow!